« . an important healthy habit you might be overlooking . These muffins look wonderful. We need a reason to heat the oven here in Buffalo, NY because it’s so cold and you just gave us a good one. Very neat how you make these without any flower. 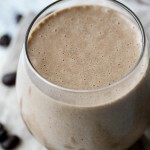 Are there particular brands you like for almond butter and almond milk? They’re usually pricier, so I was wondering if you had suggestions for finding them cheaper (and still tasty). Thanks! For almond milk, I really like Silk unsweetened vanilla since it doesn’t have any added sugars or Carrageenan. For almond butter, I usually go to Costco and buy the Kirkland brand since it doesn’t have any additives and it’s nice and drippy. I know AB can be pretty expensive, but Costco makes it a little more reasonable. are these shippable?? 😉 You are amazing girl. Come cook for me? Confession: I only managed 7 muffins in one of my batches because I ate two muffins worth of batter 😆 Oops. These look so good and perfect for these snowy winter mornings. I have been slacking on my meal prep so I think I will make these to pack with me for classes! I think that’s a great attitude to have, Tina. I’m a huge fan of plant based diets as well, but I know that I’d start running into problems as soon as I tried to label my eating habits. Yum! I don’t belong to a diet camp either and I’m totally ok with that. I can’t remember the last thing I baked, which is sad. We were gonna bake a cake yesterday for my birthday, but lost motivation haha. Egg, no egg, flour, no flour, gluten free, vegan, whichever way you look at it, those are some gorgeous looking muffins 😉 I like to experiment with gluten free and vegan recipes too, even though I’m neither of those! 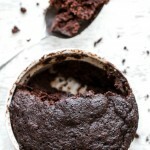 I baked chocolate chip cookie bites yesterday – I call them bites because I baked them in my mini muffin pan. They came out really cute – vegan recipe too! The last thing I baked were chocolate chip cookies for 2 (chocolate covered Katie’s recipe). I live with my bf and since there’s only 2 of us I didn’t want to be stuck with a huge batch of cookies. I have to admit I love to taste the batter and I almost always do it, even when I’m baking with eggs. I live in Switzerland though and the risk of salmonella is not that high here. These look divine! I love all your recipes, mainly because they all involve baking and let’s be honest… baking >>> cooking! I wonder if I can replace the oast with buckwheat flour in this recipe? I have a bunch of extra flour lying around that needs to be used up asap! These look like another winner. I have been obsessed with all your muffin recipes! I think I have made all of them in the last month. Also am loving your stance on what kind of eater you are classifying yourself as. I often struggle with that because I am kind of a hybrid mix of all of them depending on the day and how I am feeling about life, how much I exercised, etc. No need to box ourselves in I guess, right?! I am glad to see you are in the same boat as me! I’m so impressed that you were able to turn these vegan and have them look so good still. That is not an easy task, my friend! Or at least for me , it isn’t. 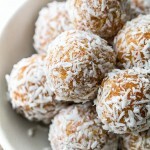 For being eggless, gluten-free, refined sugar-free, dairy-free, and oil-free these have a phenomenal texture, Amanda! I love banana bread anyway I can get it – I’ve never ever made it myself, I have a neighbor a few doors down who drops off some when she bakes up a batch – all warm and fresh! Sometimes with chocolate, sometimes without, sometimes with nuts and one time she even put in zucchini – but everytime it is delicious! 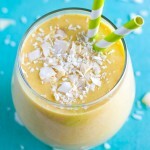 This recipe looks ohhhhh-mazing. Can’t wait to try it! Eeeee these sound outstanding! I’ve been dying for banana bread but we have zero ripe bananas in the store. So by the time they’d be ripe enough for bread or anything, I’ve eaten them all! Problems. I will have to wait it out with my latest batch of naners and make some of these. I have the same.exact.problem with my bananas! I actually end up buying more than I know I’ll eat so that they have a chance to sit and ripen. Then any that start getting -too- ripe get frozen for smoothies. The last thing I baked was an apple crisp – my parents were in town for the night so I made it as a treat for all of us! So yummy! Hehe it -is- a serious question! And normally I’d agree with you that everything is better with chocolate chips, but I actually prefer my banana bread without. Shh. Don’t tell. I love banana bread, and with this recipe being flourless and high protein, I’m willing to bet it’s totally awesome! And it looks pretty quick and easy too. Sweet! I am impressed with those despite not having any flour in them. I do agree that everything is better with any chocolate. One reason I cannot bake a lot is because I just eat half the batter! I don’t even hide it. Just say it, I’m okay with the fact: you added the batter warning for me and for me only. Because yes, rumor has it when I bake and the recipe states it’ll yield xyz amount of cookies/muffins – that will not be the case for me. Or – if we’re talking cookies – one or two of them will be pitifully small just so I can claim the yield was exactly what the recipe stated. Now all that’s left to say is that these are SO cute. And likely delicious, too, but cuteness always adds bonus points. I’m in the “I love food” camp. 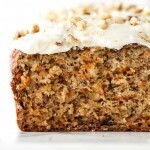 Banana Bread sounds wonderful, especially in 5minutes! Banana bread is always better with melty gooey chocolate chips! I honestly don’t bake…I leave that up to my clients who love to bake for me and feed me. A client actually has perfected one of your muffin recipes and gave me a bag of them yesterday…She made them into mini-muffins, which I toasted, put on top of Greek yogurt, and added a spoonful of nut butter…Amazing-Balls! These look awesome! bummer that I.hate.bananas! Gasp! I know, I know I just can.not. embrace them!!!!!!!!!!!!!! More for you! Yay! Love you girl! Yum these look amazing. I pin pretty much everything you post! I totally hear you about experimenting with food. Some people might find it weird that I have chicken recipes and vegan recipes on my blog, but that’s just how I eat. Why box ourselves into one label? These look delicious! 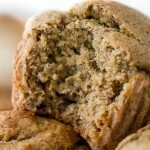 I just so happened to bake banana muffins today too – although mine weren’t vegan or GF. Awkward but aren’t you paleo? You know my thoughts on dietary experiments. Except for those whom eat smoothies. Not cool. No chocolate chips! I feel like they ruin it! These muffins look perfect! I’m honestly completely clueless when it comes to cooking in the microwave. Sorry, Ellie! Oh yes! 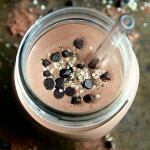 Almost everything is better with chocolate chips, in moderation. I haven’t baked for a week, so I think I’m going to do something tomorrow. Maybe I’ll try these bananas, if someone doesn’t eat the bananas first. Or I’ll try a different one. Thanks for the recipe. It looks yummy Amanda. 😆 I used to have to hide my bananas when I still lived at home so no one would eat them. Now that I live alone I don’t have to worry about it so much. Imagine if we all ate the same thing….we’d be so boring. You rock on with your muffin self. I like variety. *Edited to add: I like YOUR variety. You never cease to amaze me girl scout! 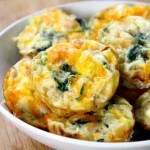 These look fab…no shocker there! mouth watering! Would the recipe still work if you are baking it as a bread and not muffins? I’ve never tried it myself so I can’t be 100% sure, Portia, but I imagine it would still work. You would just need to adjust the baking time and bake it for longer. I was googling healthy muffins yesterday and landed here. Just finished making your muffins and had to revisit to thank you. I don’t have a blog or anything, just a middle aged claims analyst who has to eat healthy, for my health. I’m so grateful you came up with this recipe. It is the first vegan muffin I’ve ever had that didn’t taste like cardboard. They really are like a slice of regular, very moist, banana bread. Followed the recipe exactly, only subbed sun nut butter for almond because of a nut allergy. My gluten free sister liked these, but I think the middle never cooked quite right and it lacked a lot of potential flavor. I’m in high school and have mastered vegan, vegetarian, and nut-free, baked goods but gluten free has been a disaster so far. These have been better than most, on that scale, but I’m still looking for recipes that would fool a “normal eater”.My brothers and sisters ate the whole batch under 10 minutes, but then again anything I bake they declare delicious- including a disastrous vegan mac and cheese with no cheese…. On the bright side, these were incredibly easy to make on a busy morning with the family running around, and used next to no dishes! I just made these and subbed 1 tbsp water + 3 tbsp natural cane sugar for the agave nectar, plus peanut butter for the almond butter. I made 8 muffins rather than 12, from this recipe with all ingredients increased proportionally x 1.5 and they cooked for longer due to that but they turned out wonderfully!!!! 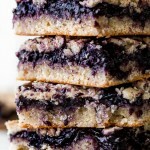 Moist and delicious, chewy and sweet, despite only having a few tablespoons of added sugar. I was so excited to make my non-vegan family members try them and they agreed that they’re delicious, even in comparison to the traditional banana bread muffins I made for them yesterday (I felt left out so I made these ones for me!) and those had 2/3 cup of sugar and a half stick of butter. I am so excited that something so tasty and sweet is actually so healthy for you, with 5 grams of protein per muffin (after my increase in the yield of the recipe) and only 200 calories each. I blended the oatmeal on its own in my food processor to make a fine flour then mixed everything by hand and the texture of the muffin is heavenly. This recipe will be staying around for a long, long time and I would unapologetically offer it to any banana bread lover, vegan or otherwise. I can’t even express my enthusiasm properly. Thanks so much for taking the time to leave a review, Mickey! I’m glad that you and your family liked them — it’s always a great feeling to show non-vegans how awesome vegan baking can be. What a great idea to use dates! I just made these and they did not turn out like your photo. I want to try them again but can you help me figure out what I did wrong? My batter was not liquidy like your photo and was rather thick so I couldn’t even get the tops to be evenly flat, but instead they peaked everywhere. I did use two bananas that were the ripest the store had- yellow but with no spots…I also used ground flaxseed meal- is that the same as ground flaxseeds? And my last potential error was that I mixed everything in my vitamix and it took a while to get it all blended because the blades just kept spinning without catching the batter because it was so thick. 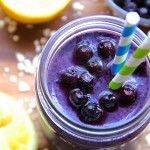 I just made these and added in some blueberries! The batter is amazing and had to stop myself from eating it all before I made the muffins! I’m so glad you liked them, Jen! And blueberries sound like an awesome addition. That’s the danger of vegan baking, eh? The batter is just so tempting! What adjustments should I make if they are sweet enough to me without the maple syrup? I would replace the sweetener with a non-dairy milk, Lydia. Start with just the 2 tablespoons, and then go up to 1/4 cup if the batter seems too dry. I have made these twice and they are delicious! I would love to see a pumpkin version 🙂 I appreciate that this recipe doesn’t have eggs. 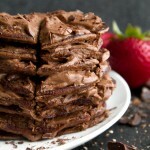 It is hard to find recipes that are both vegan and flourless! 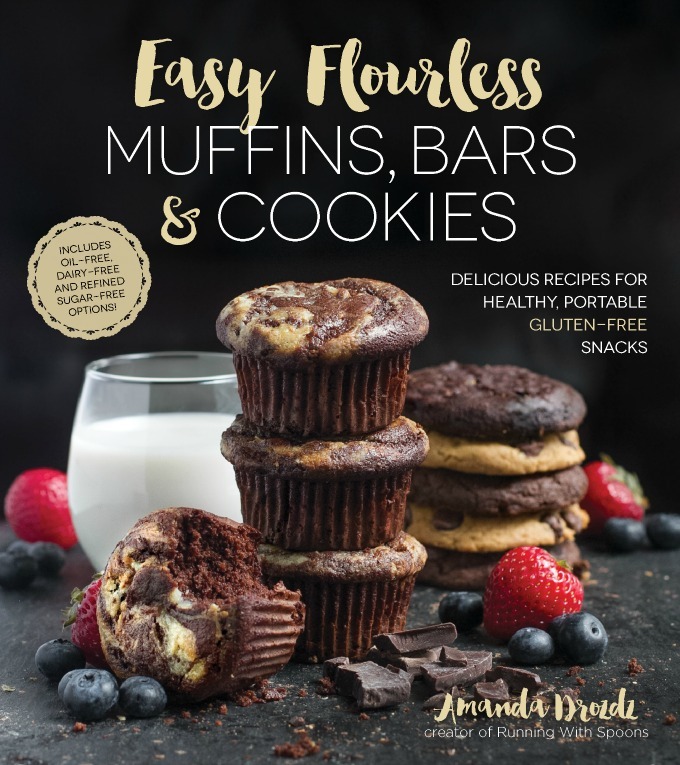 HI, I tried these today,they are awesome.wehad them for our breakfast.these are delicious without any oil ,sugar and eggs, flour also.extremely healthy yummy muffins .Thankyou …. I’m with Patty here, as I have baked them twice, each time resulting in a gummy texture. If you REALLy like batter, the end result is not much different from the batter. I wanted to like these with all of the wonderful comments, but with most of those from folks who had NOT yet tried it, I should’ve known. Hi, just made these with a couple of substitutions. Used a normal egg and also some hemp protein instead of the ground flaxseed. They were delicious especially eaten warm. Good thing I only made 5 as I could have finished many more! I made two mini loaves with this recipe (while I study for finals) and they are cooling as I type this! My apartment smells DIVINE and I had to lick the mixing spoon clean for a taste test. So yummy! I don’t have muffin liners…can I bake this into a loaf? I made these today and loved the texture and taste but they weren’t sweet at all. I used honey instead of agave, chia instead of flax and peanut butter instead of almond. 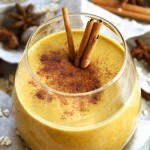 I am going to try them again and add more cinnamon and maybe try adding some maple syrup too. Thanks for the recipe, it is a good base to start with until I get the flavor I’m looking for! Mmm LOVED these!!! I used a regular egg and made oat flour in my food processor, then mixed everything by hand. Also added some chopped pecans, When they were done I dipped the tops into melted butter and a mixture of coconut sugar and cinnamon. They were excellent. I really like the fact you used oatmeal, almond butter and a little sweetener. Thank you for posting this recipe.